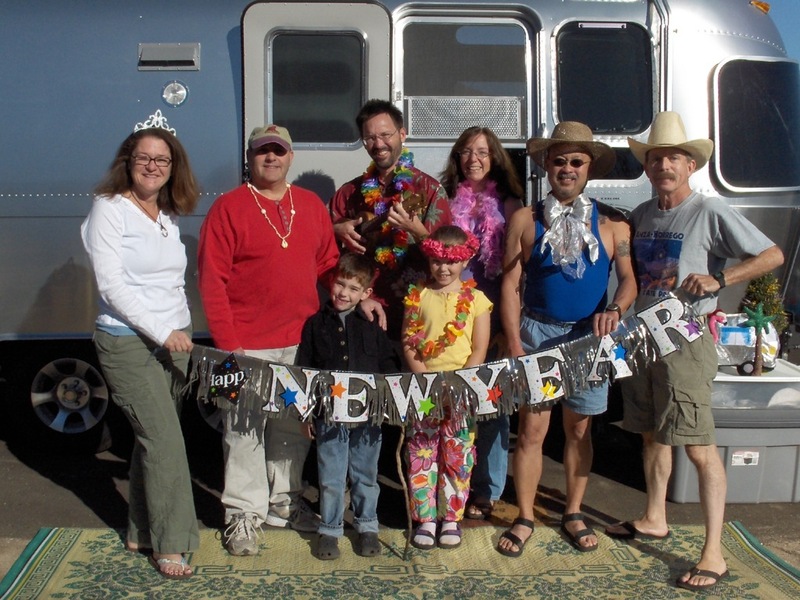 Ten years ago we celebrated New Year 2008 at Anza-Borrego Desert State Park where I was presented the opportunity to be one of ten blogging contributors to Airstream Life Online Community. 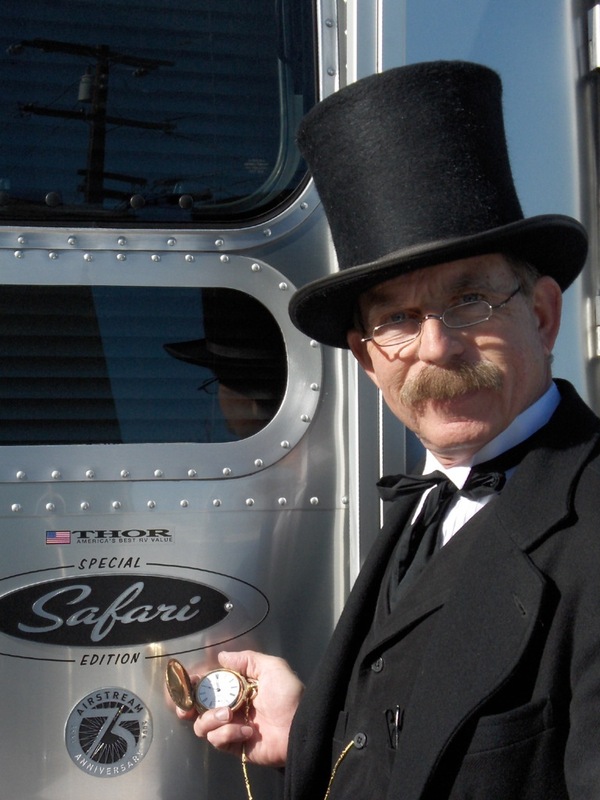 My first History Safari Express blog post, “All Aboard…,” was launched on January 11, 2008, and began a 10 year odyssey of documenting how we used our custom-ordered 2007 Airstream Safari in southern California, while celebrating the seasons and meeting new friends. 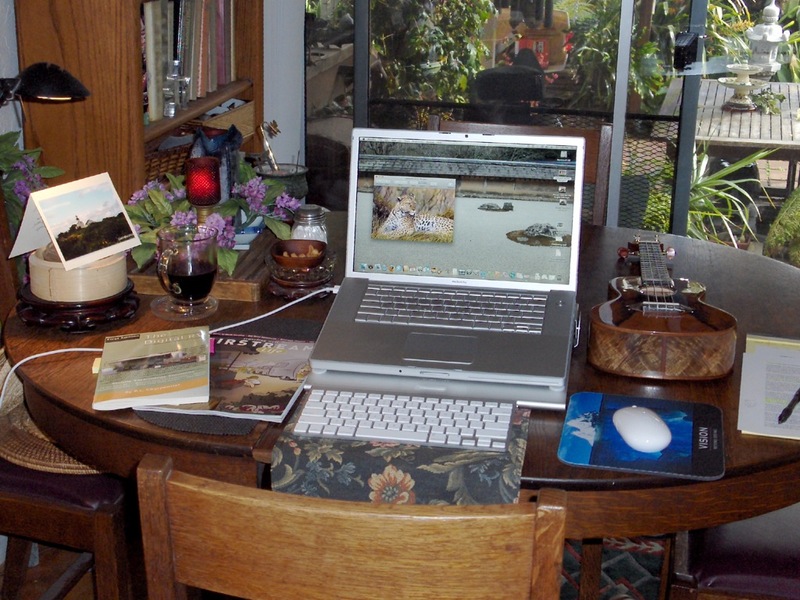 Ten years ago, I switched from a PC to a Mac* and acquired the MacBook Pro that I’m still using today! 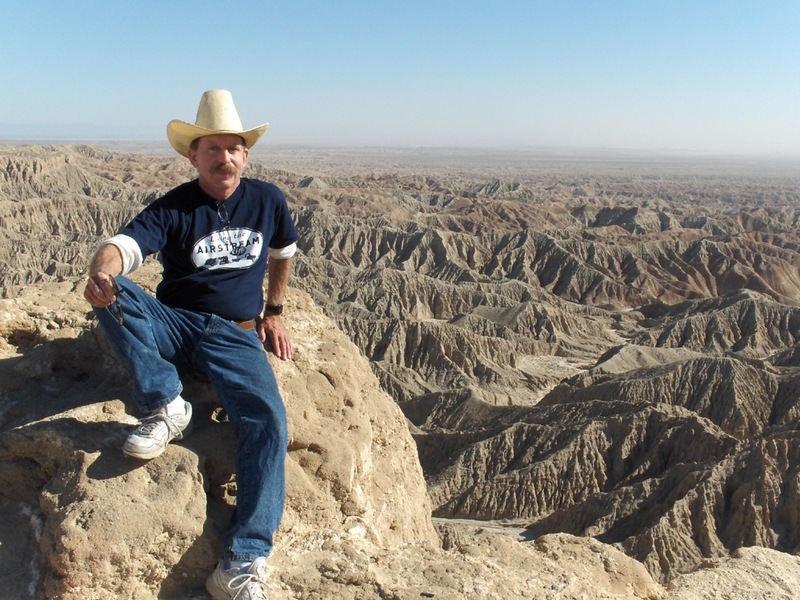 We returned to Anza-Borrego in January 2008 where I explored Palm Canyon (Palm Oasis and Planet Earth). 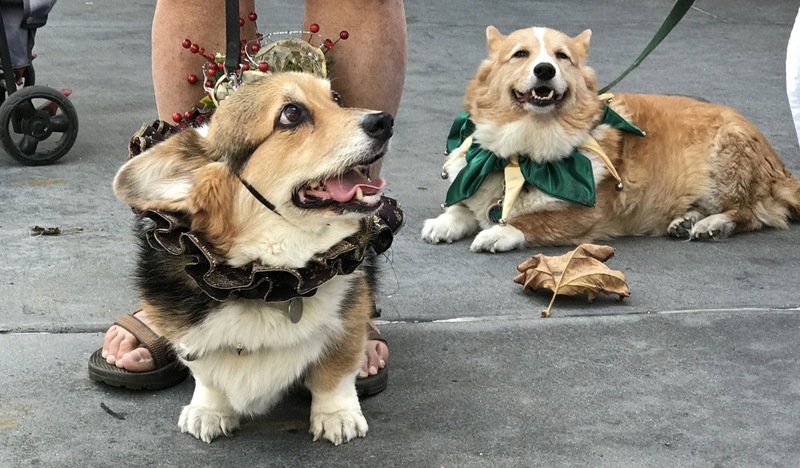 Happy and bright times in 2017 included taking our tricolor corgi Tasha on many San Diego Corgi Meetup outings (see photos) where she enjoyed showing off new collars and decorations made by Larry (who also made the jester’s collar for Sidney seen below). 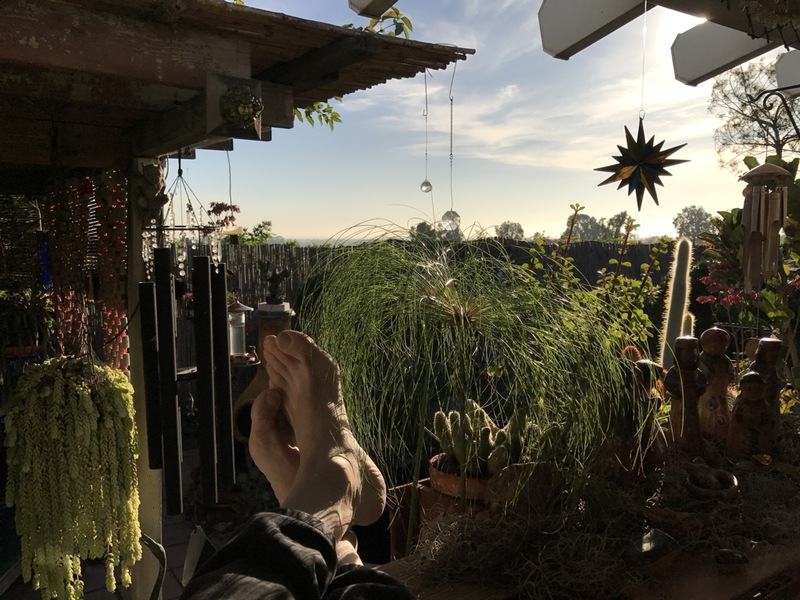 Old Man Winter was ringing in the New Year with Arctic air over much of the country as a hummingbird drank at our feeder while I wiggled my toes in sunny San Diego and listened to “The 2017 Song – A Year in Review La La Land Parody,”* sung by Tessa Netting! 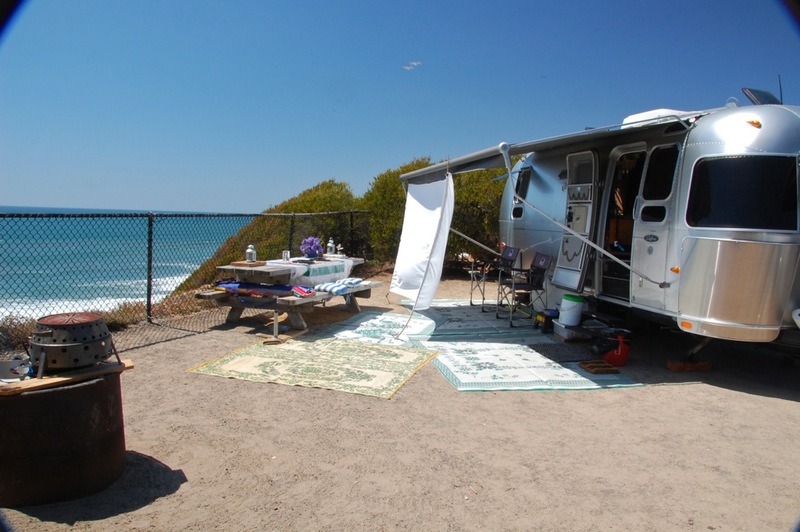 For the next 10 years our family enjoyed the form and function of this iconic trailer* while camping in the beautiful desert, mountain, and beach parks in San Diego County and meeting and making new friends along the way. 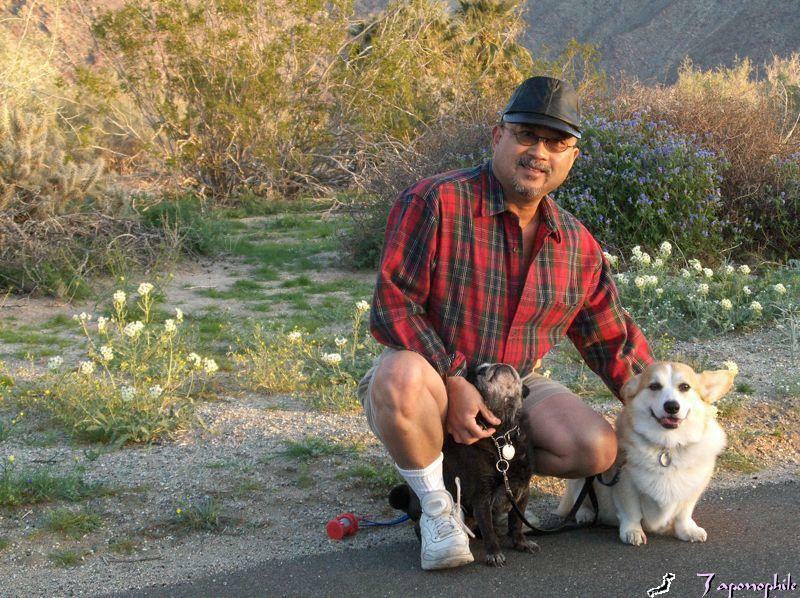 As I entered the seventh decade of my life, my body began telling me that I should lighten the workload and yet still enjoy being a California day-tripper. 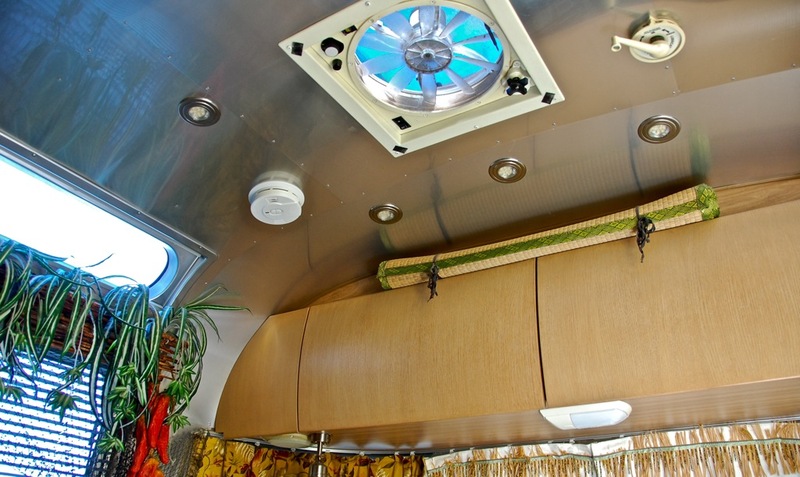 * So we decided to find the right person to buy, enjoy and love this Airstream as we have. 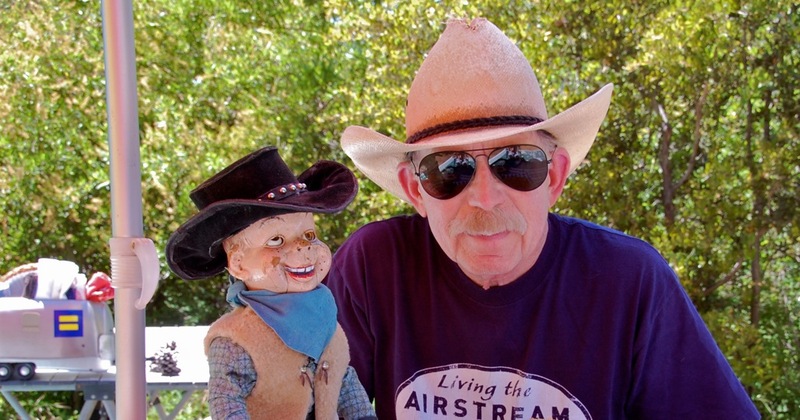 To this end, we first contacted friends and then placed our ad on AirForums’ Airstream Classifieds on September 13. The first responses were from dealers who wanted to buy it for resale. 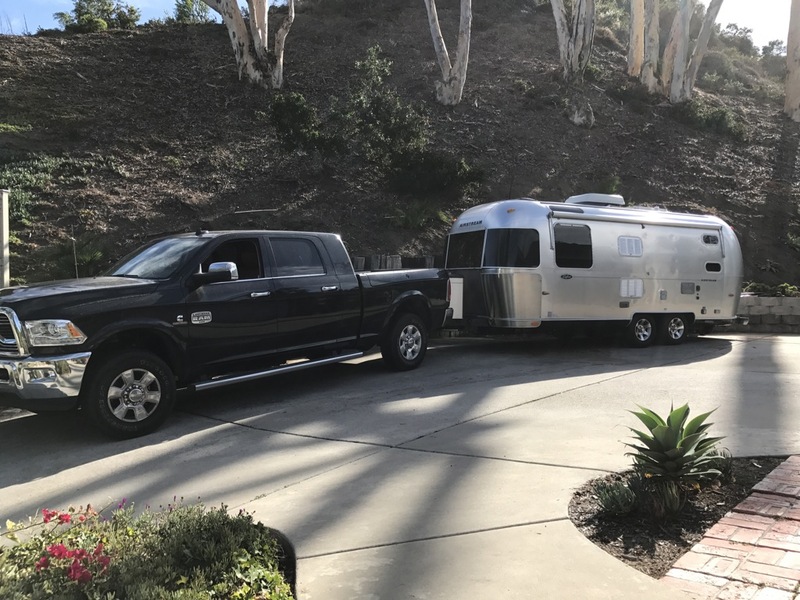 There were 18 other inquires and I asked each one to tell me something about themselves, interest in Airstream, RV experience, how they would use the trailer, and what they would use as a tow vehicle. Two days after the ad was posted, we got a positive response that looked promising from a local, young family who came to see the trailer and decided after a few days of serious contemplation that this trailer would be a perfect match, and we agreed! The transaction was completed with a cashier’s check, bill of sale, and the Notice of Title Transfer and Release of Liability. I then reviewed with the buyer how everything worked and assisted in hitching up the trailer to his 2016 RAM 3500 truck. I then followed him in our truck, filled with camping items that we no longer needed, and assisted him in parking and unhitching the trailer. 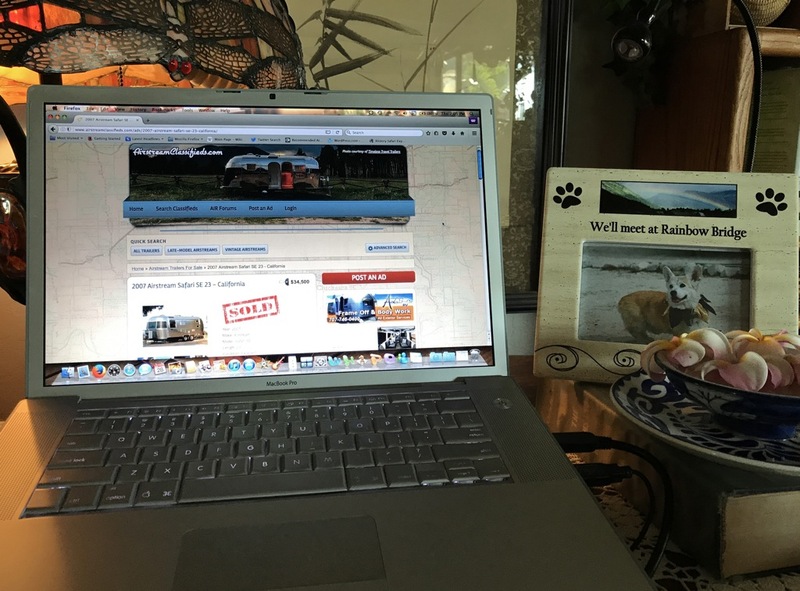 Our Safari was beaming, looking happy, and right at home in its new homeport! Also looking happy, the new owner said he and his family are absolutely thrilled with the trailer! 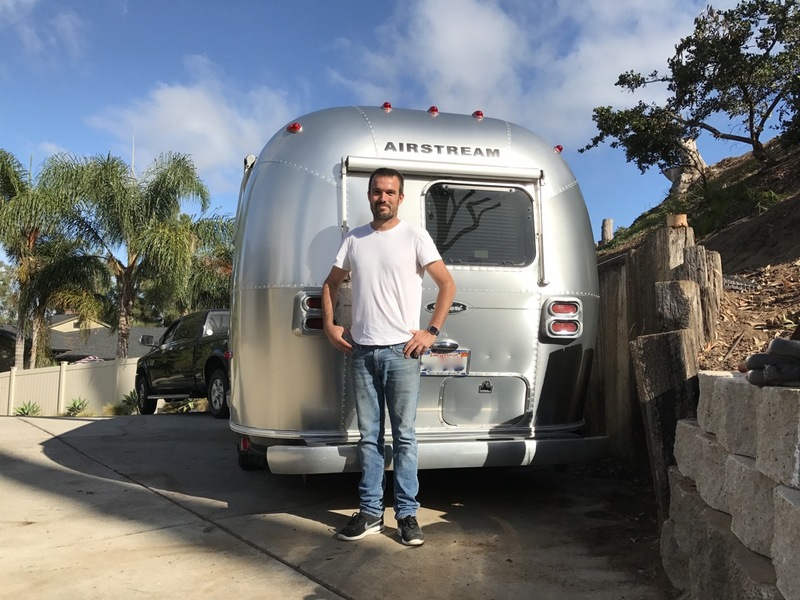 And we are happy and thrilled to pass this iconic Airstream trailer on to a younger generation that will give it love, good use, good care, and a good home! 10-year sealed battery requirement for smoke alarms! More cities and states are now requiring that “new smoke alarms that are solely battery powered must have a non-replaceable, non-removable battery that is capable of powering the smoke alarm for at least 10 years.” Kidde lists the following states and cities with 10-year smoke alarm laws: Oregon, California, Louisiana, North Carolina, Georgia, Maryland, Phoenix, New York City, Madison WI, Milwaukee, Philadelphia, and Louisville. Although many of these laws, such as California’s smoke alarm requirements, apply to dwelling units intended for human occupancy and not to mobile homes or coaches, the laws impact RVers by limiting the selection of types of smoke alarms locally available when it is time to replace a 10-year old alarm (its life expectancy). 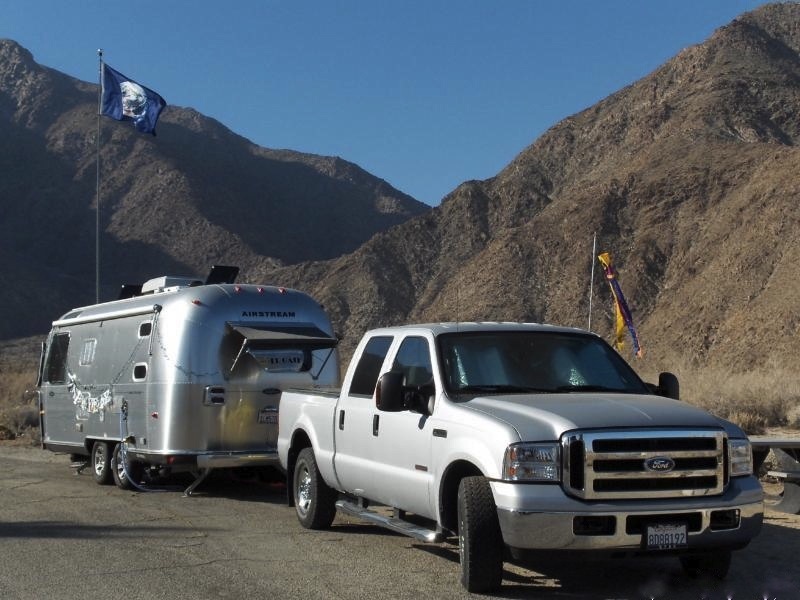 Our 2007 Airstream Safari is now 10 years old and like clockwork, its OEM Universal Security Instruments SS-775 smoke and fire alarm installed by Airstream (seen below in upper left corner) stopped working and required replacement. Once I decided on getting a smoke alarm with the 10-year sealed battery, I had to choose the sensor type: ionization, photoelectric, or a combination of both. See the excellent video “How do Smoke Detectors Work“. * This video explains that photoelectric sensors are better at detecting slow, smoldering, and generally smokier fires, whereas ionization sensors are better at detecting smaller amounts of smoke that come from fast flaming fires, and are more common and less expensive. Our OEM smoke detector used an ionization sensor. I found and installed an economical, ionization smoke alarm with good reviews: Kidde i9010 model (aka Code One 10-Year Lithium Battery Smoke Alarm at Home Depot for $17.97). 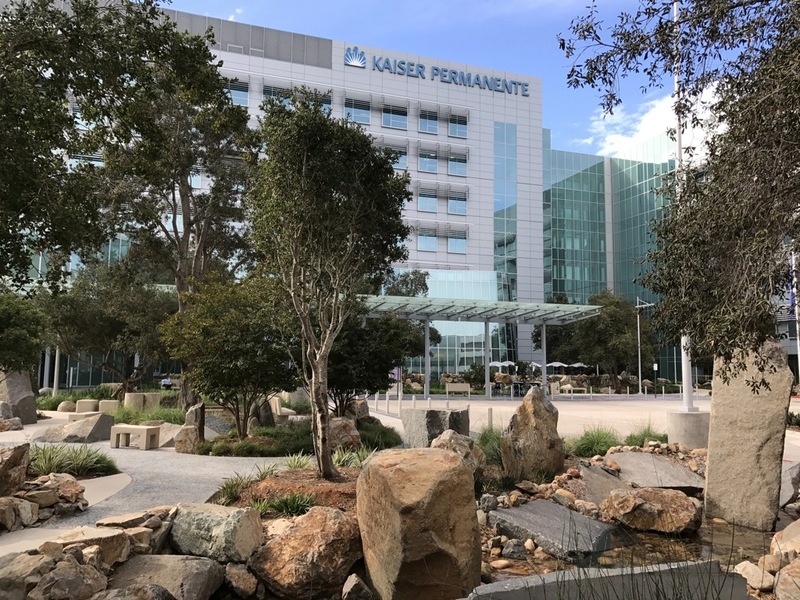 One of its features is that it has a Hush Button that allows nuisance alarms to be quickly silenced, as required by California’s Updated Smoke Alarm Requirements. For example, if the alarm goes off when cooking and the hush button is pushed, you have about 8 minutes of silence, permitting time to open the door, windows, and turn on exhaust fans to clear the air! 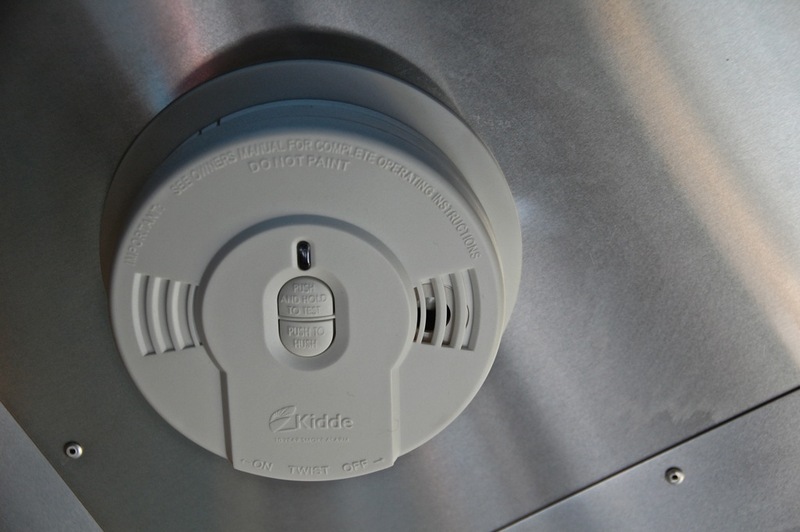 Our new smoke alarm (seen below) is about an inch wider and was placed in the same location as the OEM model. I reused one of the original alarm ceiling holes and started a new hole with a smaller drill bit for the other screw. I used the original OEM model screws since they were shorter than the ones supplied with the new alarm (and I didn’t want to risk puncturing the exterior aluminum panel)! The mounting bracket was screwed in place and the alarm was placed on the bracket and rotated clockwise until it ratcheted in place and automatically activated as indicated by an audible beep and confirmed by pushing the test button. The sensor was tested by blowing out several votive candles under the unit, which then elicited its signature sounding of high pitched triplets. * This unit is equipped with a red LED indicator light that flashes about every 40-45 seconds in the standby mode indicating it is receiving power. 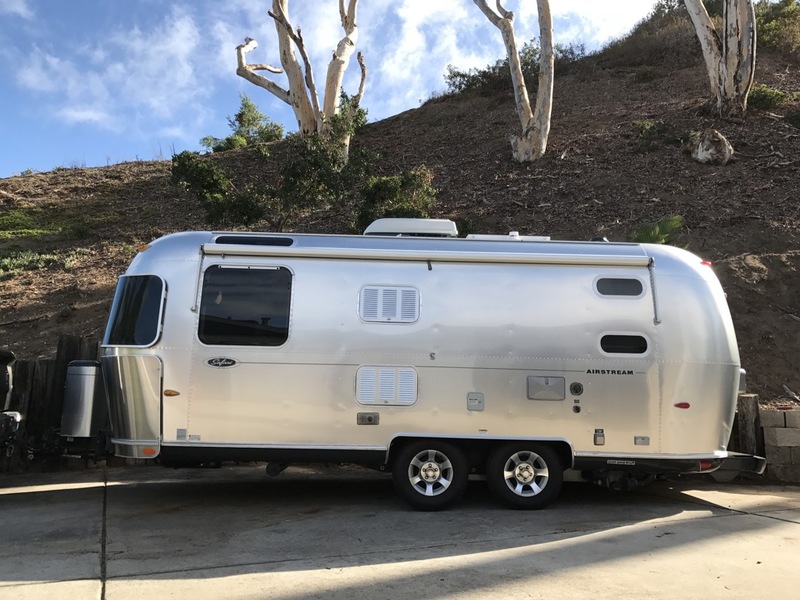 Airstream commemorated the retro style, along with its 75th anniversary by releasing 75 Commemorative Edition Travel Trailers designed by David Winick and the first Airstream Basecamp (model year 2007). 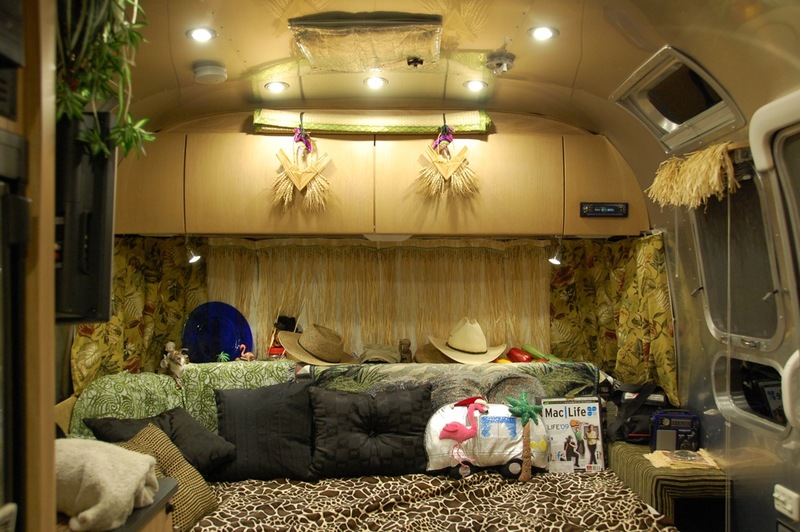 See Colonial Airstream‘s Patrick Botticelli give a detailed walk-through of his 2007 Basecamp,* the ninth one made. The original Basecamp had large clamshell rear doors that provided access for loading in a motorcycle, quad, or bike. See Patrick come into his Basecamp out of a cold, snowy New Jersey night and load his mountain bike,* light a Mr. Heater Buddy and proceed to cook a meal. 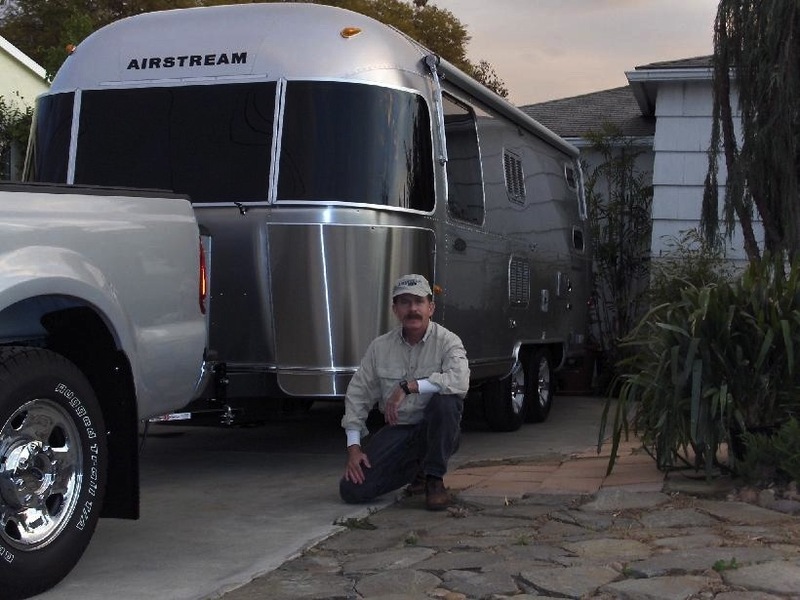 Unfortunately, the end of 2007 also marked the beginning of the Great Recession in the United States and Airstream had difficulty attracting buyers for the next two years, selling only about 220 Basecamp units, says Patrick, and Basecamp production stopped with the 2009 model. Bolstered by the improving U.S. economy and increasing consumer confidence, Airstream is now growing and coming out with new models such as the Nest Caravan in Summer 2017 and the greatly improved 2017 Airstream Basecamp, being relaunched now. See Airstream’s exciting video, “Introducing the new Basecamp,”* and a “Walk-Through 2017 Airstream Basecamp“* by Patrick Botticelli. Patrick says, “Airstream found out that only a small percentage of their [original Basecamp] owners were actually using the back cargo for motorcycles or quads… you had to open up the rear door and drop the steps every time you wanted to come inside [and pull up the steps every time you wanted to close the door].” For the new Basecamp, Airstream added a side entrance door for easy entering and exiting the trailer, while keeping a rear utility hatch for loading gear such as backpacks, mountain bikes, and kayaks. Patrick says this all-new Basecamp is more robust with its buck-riveted aluminum structure on an A-frame, like regular Airstream trailers (original Basecamp had aluminum plating on a fiberglass shell on a center beam), and the many new features such as the Truma Combi heater for water and room heating, SeeLevel II Battery and Tank Monitoring System, optional Zamp Solar System (with two 80-watt solar panels, AGM battery and a Zamp Solar Disconnect Port by the streetside front A-frame for connecting additional portable solar panels), optional Coleman-Mach air conditioner (9200 BTU) and a Fan-Tastic Vent Fan (or 2 Fan-Tastic Vent Fans without the optional air conditioner), bathroom with shower and a China toilet bowl, interior and exterior LED lights, 3 cu. ft. 2-way Dometic refrigerator, folding galley water faucet over a stainless steel sink with folding lid (provides additional counter space), 2-burner recessed cooktop, optional Contoure microwave, pop-up electrical sockets with USB port on galley counter, and 2 movable pedestal tables in a lounge and eating area that converts into a large 76″ by 76″ bed! The Unit Base Weight (UBW) without options is 2585 lbs.,* Hitch Weight is 410 lbs. (dry, no options), and the Gross Vehicle Weight Rating (GVWR) is 3500 lbs., which means this trailer is easily towed by mid-size SUVs. The new Basecamp comes with a 22-gallon fresh water tank, a 29-gallon black/gray water tank, two 20-lb. propane tanks, and a Propane Quick Disconnect port just under the curbside front A-frame for connecting a hose to a low pressure portable gas BBQ grill. 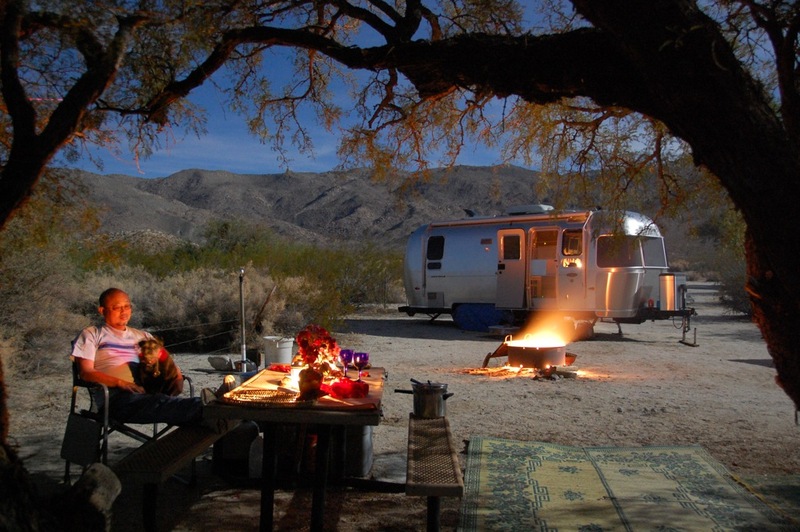 See Airstream’s Basecamp webpage for their Overview, Design, Features, Floorplan and Brochure. 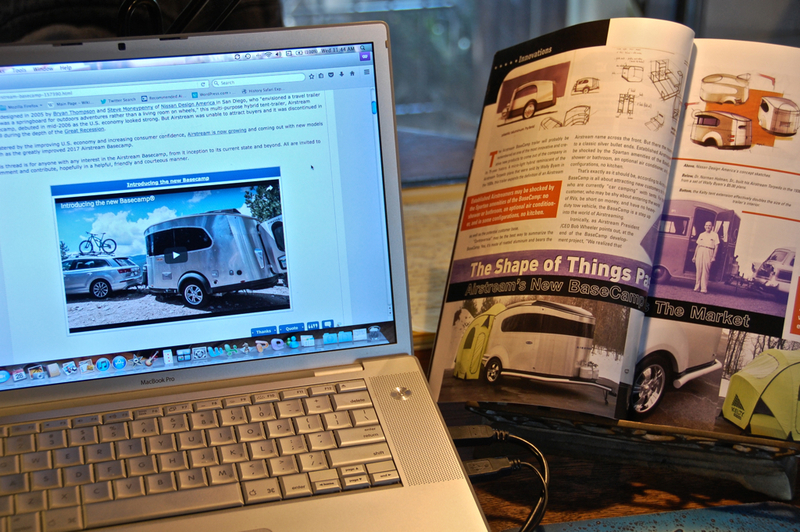 See Airstream’s 2017 Basecamp Owner’s Manual (PDF) for additional information. 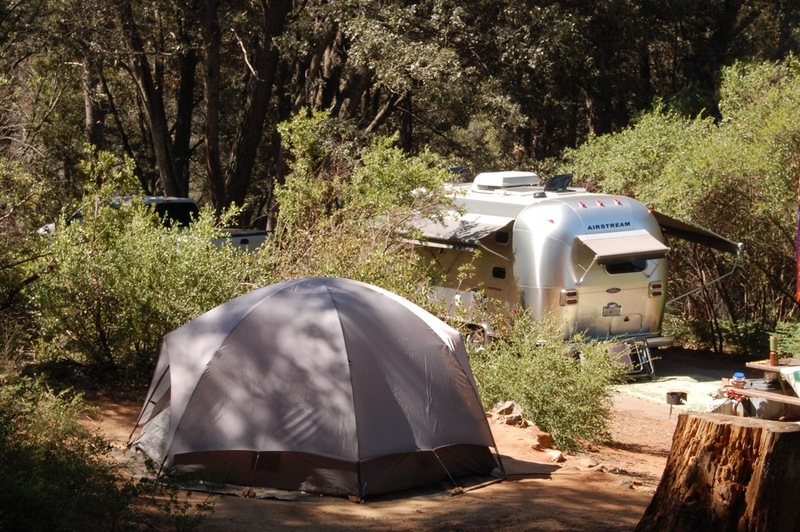 Basecamp has a MSRP of $34,900 and is being shipped to Airstream dealers beginning in October, says Outside Interests‘ article, “Basecamp,” in their September 26, 2016, newsletter. 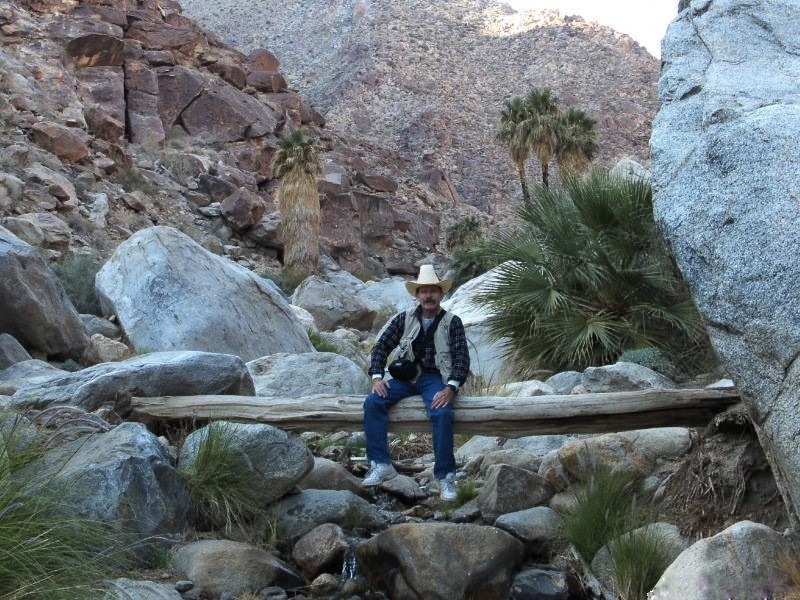 Whether you’re a fan of mountain biking (such as Patrick),* kayaking,* or just living riveted,* you can be one of the Fans of the Airstream Basecamp and see more information, news, updates and videos of the Airstream Basecamp. A damp and chilly fog had drifted in though the mountains and around our Airstream trailer as I took our dogs on an early morning walk and spotted what appeared to be the strange image of an approaching dementor,* which I had first encountered here two years ago. 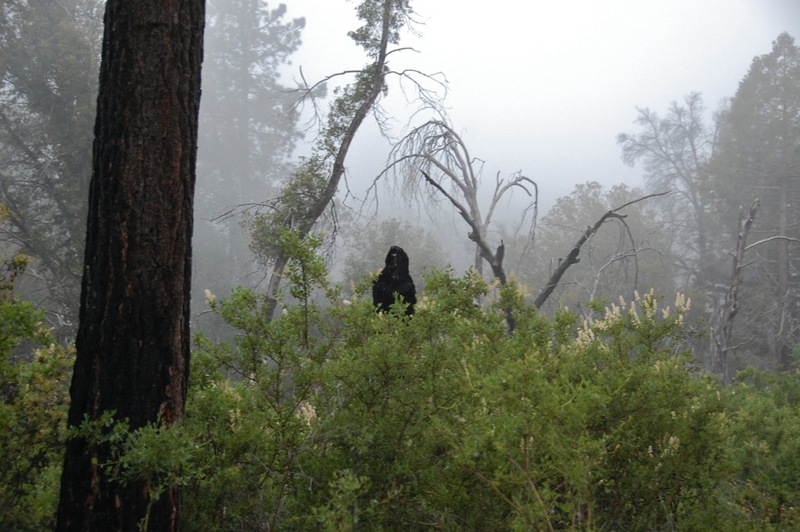 It turned out to be one of the many ghosts of trees burned in the 2003 Cedar Fire. As the morning sun burned off the fog, we enjoyed working on projects and viewing the wildlife around our campsite. 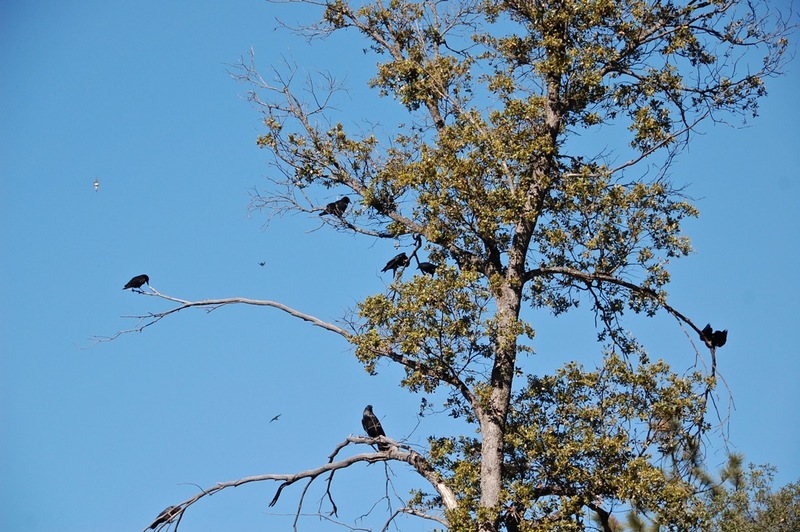 Suddenly, our attention was captured by a murder of crows angrily cawing and swarming* from one tree canopy to another and then we saw it. A beautiful gray fox walked by, just fifteen feet away. 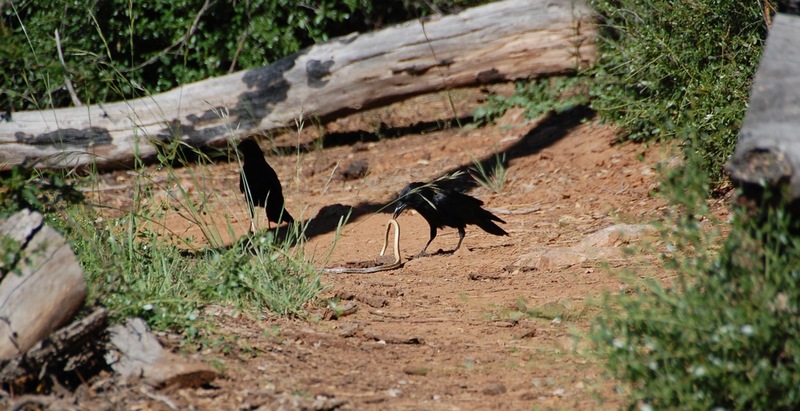 The crows followed the fox to the Cedar Trail and I followed with camera in hand. As I turned a bend, the fox saw me and dropped a snake that it had just caught. The crows attention now focused on their next meal, the snake! 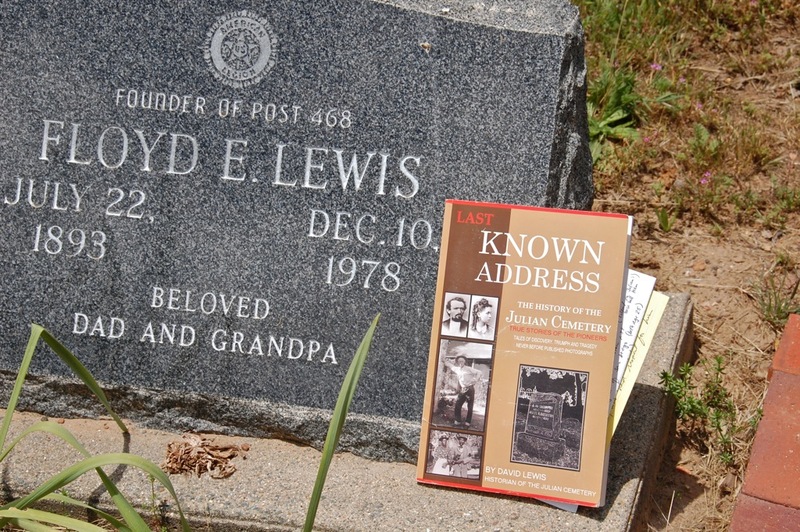 David Lewis’s grandfather, Floyd Erving Lewis, is also included in his book, along with the curious story of Leandro Woods, and both are buried in Julian’s Haven of Rest, Pioneer Cemetery. 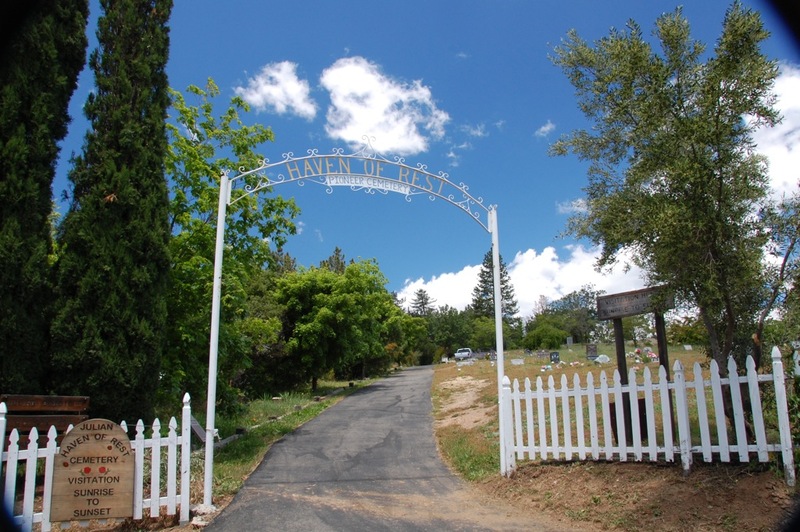 Robert Y. Allen is also buried here and, the day after Howdy Doody paid his respects, I returned to the Julian Cemetery to find the gravesite of Leandro Woods, with the help of David Lewis’s book. 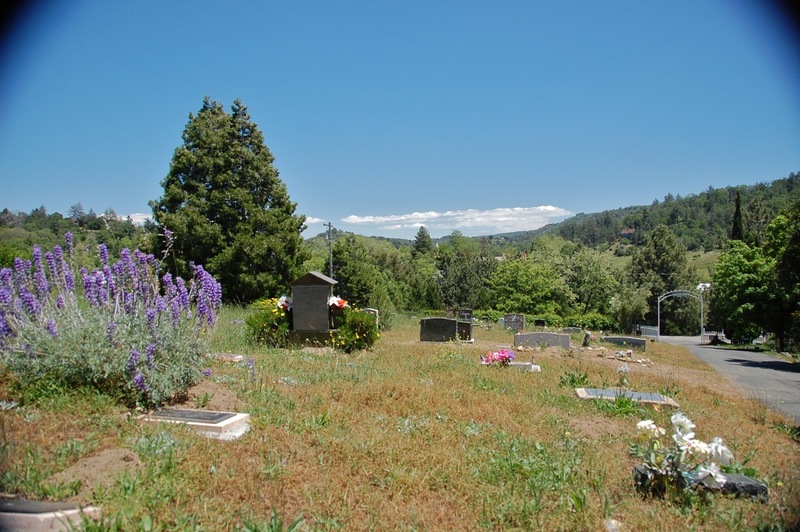 The cemetery is on a hill overlooking the town and David’s map shows that Leandro Woods is on the NE edge of the new section first used in the 1950s. 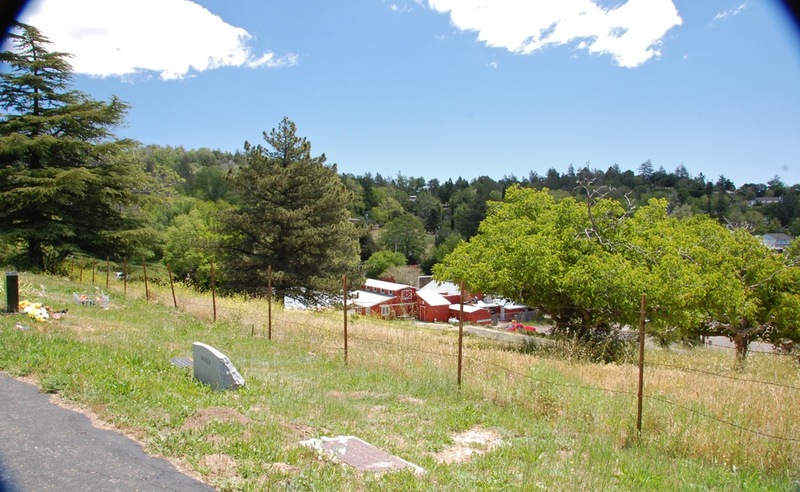 So I carefully and slowly walked up and down this hill several times without finding Woods’ grave marker. 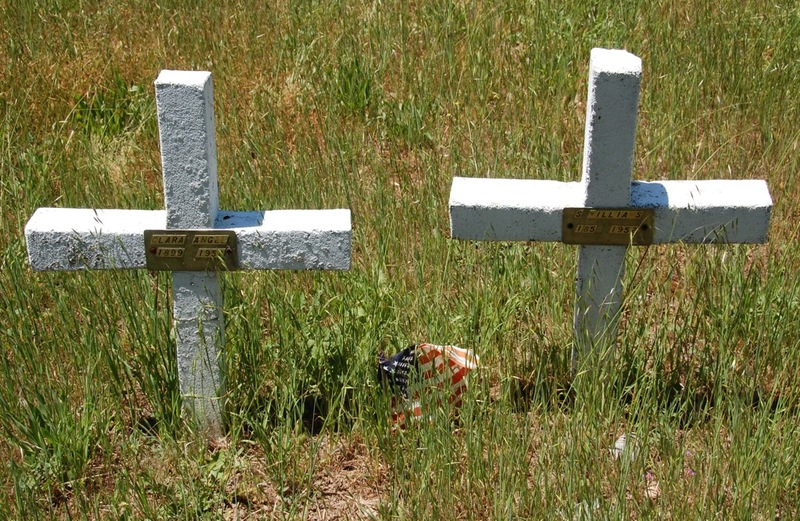 I did find the grave marker of Susie Coleman Williams, the daughter of Fred Coleman, next to the grave marker of her daughter, Clara Angel. 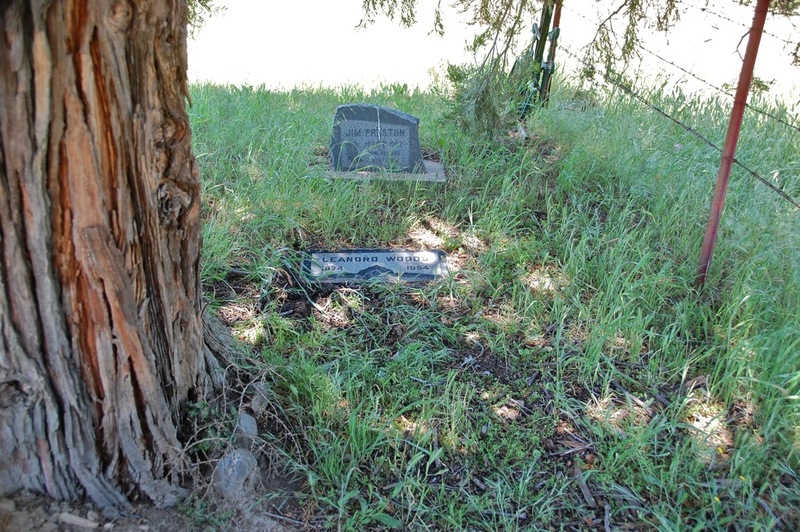 I finally did find Leandro Woods’ grave marker, hidden between the large cedar tree and the barbed wire fence on the edge of the cemetery. 3. Charles R. LeMenager, Julian City and Cuyamaca Country: A History and Guide to The Past and Present, Eagle Peak Publishing Company, Ramona, CA, 1992, page 88.